The attraction to religious life began early for Sister Peggy. She was born into a devout Catholic family in Pendleton, Oregon, where Maury and Marie Kennedy and their six children (Jack, Rock, Peggy, Jim, Lauri, and Mike) regularly participated in the life of the Catholic community. She attended St. Joseph Academy and cleaned the Sisters’ chapel every Saturday morning. Her interaction with the Franciscan Sisters revealed that their simple life-style of prayer and ministry was permeated with happiness. After moving to Spokane as a sixth grader, she was befriended by the Holy Names Sisters at St. Aloysius School and Holy Names Academy, where her desire to enter religious life blossomed. 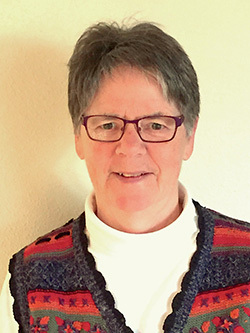 After her entry into the Holy Names Community, Peggy spent happy years as a teacher or administrator at St. Mary Magdalen in Everett, St. Alphonsus and Our Lady of Fatima, Seattle, and St. Patrick’s, Spokane. She left formal education to live in a poor section of downtown Spokane, where she was transformed by the humble transparency and true holiness of the people with whom she lived. Aware of the vulnerability of women who lived on the street, she co-founded Miryam’s House in Spokane, a residence for women seeking support for their efforts to change. Miryam’s House was the first sponsored work of five religious communities of women working together in the Pacific Northwest. Ministry at Miryam’s House led to her work at Spokane Mental Health with families court-ordered into treatment because of abuse and/or addiction. Sister Peggy served in leadership for the Washington Province (while living at Graceworks, a SNJM residence for women leaving prostitution) and then at the Congregational level after one year as Mission Director at Mary’s Woods at Marylhurst. She then worked among migrant women at Nuestra Casa in Sunnyside, Washington, followed by ministry at Solanus Casey Center among homeless and very poor people in Seattle. She currently serves as a facilitator for various groups in Washington, Oregon and Mississippi.